You’ve probably, by now, heard of the BDP-S570. In fact, a lot of you probably already own one, but if not, and if like us, you’re a bit on the slow side, we’ll try and explain to you why you’ll probably want one. The Sony BDP-S570 has already won a prestigious ‘Best Buy’ award from What Hi-Fi and it hasn’t been out that long – it’s that good! In fact, Sony seems to be consistently producing top quality Blu-ray players and this aptitude has certainly been carried over in to it’s new range of 3D compatible Blu-ray players. The BDP-S570 sits near the top end of this latest crop of players. It’s looks come from Sony’s latest Monolithic design mantra meaning the sleek black player is definitely a stylish piece of kit to show off in your living room. The blue lighting used throughout also adds a touch of class and long may this trend of matching blue and black continue. Connectivity is provided in the form of an Ethernet port, a couple of USB ports for media playback, the 3D compatible v1.4 HDMI socket, the usual suspects of video and audio out, a co-ax and opitcal digital outs and best of all, a built-in Wi-Fi controller (supporting up to 802.11n standards) meaning dongles are not required, thank you very much. Thanks also to 1Gb of built in memory, you don’t need an extra USB memory stick to deal with BD Live either. Moving on from last year’s players, this is a revelation in itself as with no Wi-Fi or memory, both USB slots were usually taken up with a mem stick and wireless dongle. Now, they can be used for more fun things such a media playback. Yipee! Where before you only had access to BD Live, with the new crop of Blu-ray players, as with Sony’s latest Bravia TV sets, you get access to Sony’s Bravia Internet, meaning a far greater level of content is available. For instance BBC iPlayer, Demand Five, LoveFilm, YouTube, Dailymotion, and Eurosport. Having the ability to stream movies from services such as LoveFilm is a very viable alternative to a Sky Movies subscription. And this is just the content available from t’Internet. The BDP-S570 also supports a dazzling array of playback formats, kicking off with most stuff you can stream to it via a DLNA capable PC. This includes MP3, WMA, AAC, DivX HD, MPEG-1/-2, MKV, AVI and JPEG formats. WMV and AVCHD are also supported when played via an attached USB device which seems a tad strange as we can stream AVCHD directly to our Bravia TV. Maybe a firmware update will change this? SACDs can be played back on the deck and HD surround sound formats are, of course, covered. DVD upscaling and 1080/24p are, of course, included. Using Sony’s Bravia Link and if you have a Bravia TV, you can control certain functions of the TV via the Blu-ray remote, which is handy for the basics should you have mislaid your TV remote but don’t expect to be able to do sound and video tweaking from it! The remote is very well laid out and not too buttony, thanks mainly to Sony’s excellent control software which keeps a similar look and feel across it’s Bravia product range to help make you feel instantly at home with the way the menus and options work and are accessed etc. The BDP-S570 certainly delivers when it comes to audio and visual quality. It’s also reasonably quick at getting up and running although still slow if you’re only now making the switch from DVD to Blu-ray. Due to the complexity and content of Blu-ray disks, it does take a while to get your content playing, although this will vary with the Blu-ray disk itself. But, if you have just made the switch, sit back and be amazed at the sheer level of picture detail on offer. Colours and black levels are both fantastic leaving the images crisp and colourful. Plonking in an old DVD will also put a smile on your face as the upscaling works pretty well and it’s only with really fast-paced scenes that you’re likely to get a bid of judder and blur but this will also be partly down to your TV set. 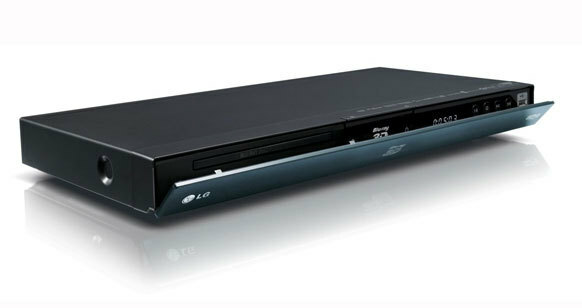 Looks like this is really the Blu-ray player to beat. With the addition of the 3D compatible HDMI port, this really does have all the bases covered and at a very competitive price. This one should be at the top of your shortlist. View the full specification on the Sony web site here.